Our plane touches down at Rome’s Fuimicino airport at 8:45 AM—right on time—and by 9:30 I’ve cleared passport control and baggage claim with surprising efficiency. 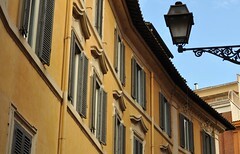 Next, I meet up with a driver from Rome Cabs and embark on a brief and uneventful journey into the city, where I check into a small, single room at the Hotel Hosianum Palace, on a quaint side street near Piazza Venezia, shower and change clothes, and call home. All the while, my mind has been occupied by these mundane tasks, by the small necessities that come with long distance travel, and by a series of familiar associations. It is comforting to remember the airport terminal and the location of the ATM machine, and I grin when see the hotel lobby again, looking much as it did when I left two years ago. I have been in a transitional state—somewhere between coming and going—but now, as I make my way out onto the street and down Via delle Botteghe Oscure, the stress of logistics begins to loosen, and for the first time I start to absorb my surroundings. 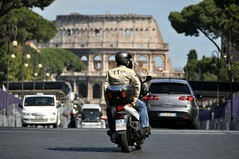 It’s a Tuesday in late Spring, and I’m standing under a brilliant blue sky in the centro storico of Rome. As I walk in search of a cappuccino, my ears catch the strains of two musicians who are playing for loose change under a shrine to the Virgin Mary. 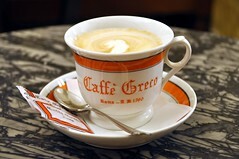 Enticing aromas are wafting out from small cafés opening for lunch. For a moment I lean against the metal railing that surrounds Largo di Argentina and peer down to see a half dozen stray cats, each stretched lazily upon ancient steps and foundation stones, warmed by the midday sun. For a fleeting moment, I think of Vermont and its long, grey winters, but the comparison quickly disappears. For the next 17 days, my life will be here and the very thought of it is intoxicating. I zig zag past Piazza Colonna and its massive column of Marcus Aurelius to Via dei Condotti, where I settle comfortably into a table at Antico Caffè Greco, one of the oldest coffee houses in all of Italy. The rooms are small and charming, with plush velvet benches and walls lined to the ceiling with works of art in old, mismatched frames. Keats and Byron and Shelley—that trio of English romantic poets—were all patrons here, and it is, perhaps, for that reason, that I feel very much at home. 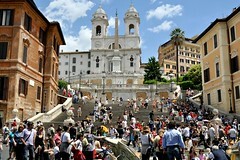 I wander next up to the Spanish Steps, which look grand and inviting to me, and apparently, to hoards of other tourists as well, because they are congregating here en masse. When I last visited Rome in 2008, the obelisk at the top was covered in scaffolding, like a tall metal skyscraper, blocking the view of the church of Santissima Trinità dei Monti. Today, all is well and the view is glorious. Crowded, but glorious. At the base of the Spanish Steps is a small museum dedicated to Keats and Shelley, and for a temporary escape from the noise outside, I duck in to browse its rooms full of books, manuscripts, and artifacts, and to see the place where Keats died of consumption in 1821 at the age of 25. 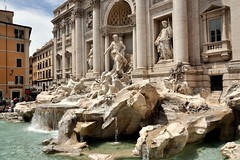 I make a brief detour to the Trevi Fountain and to San Crispiano for a dish of pear and grapefruit gelato, before heading up the Quirinale hill, the highest of Rome’s seven hills. So far I’ve been merely stretching my legs and my jet lagged body for the main event of the day—a major Caravaggio exhibit at the Scuderie del Quirinale, a renovated space across from the presidential palace that was once used by the Vatican as a stable for the pope’s horses. The year 2010 marks the 400th anniversary of Michelangelo Merisi da Caravaggio’s death at the age of 39. To mark the occasion, the curators in Rome have gone to great lengths to borrow the artist’s finest works from museums around the world: “The Supper at Emmaus” from the National Gallery in London, “The Cardsharps” from Fort Worth, Texas, an amorous cupid from Berlin, and “The Taking of Christ” from Dublin, among others. As a result, newspapers have reported outrageously long lines. Ordinary timed tickets have sold out, as I found when I tried to buy one online weeks ago, so I opt for a Caravaggio Card instead. For a slightly higher cost, I gain priority admission, as well as a free pass for a sightseeing bus that travels to various churches around town where other Caravaggio paintings are on display. The rooms inside are dimly lit, but noisy with the chatter of local school groups, who sit in crowds on the floor before one painting, then the next, listening in half attention to the commentary of their teachers. For a few Euros, I rent an English audio guide for the exhibit, but soon find myself falling into the same distracted state. The descriptions are dense and academic, as if drawn from an art history lecture, which would normally appeal to me, but here it feels entirely at odds with the drama and raw emotion captured on canvas. Halfway through the chronology, I abandon the headset entirely with no regrets. Before coming, I read Jonathan Harr’s book, The Lost Painting: The Quest for a Caravaggio Masterpiece, so I know something already about the artist’s violent life and the allure of his work. It has made me particularly keen to see “The Taking of Christ,” a painting long thought lost, but finally rediscovered on the wall of a Jesuit dining room in Ireland in the early 1990s. From the exquisite lighting, to the realism of the soldiers’ armor, to Caravaggio’s self-portrait holding a lantern at far right, it does not disappoint. With my energy flagging, I leave the museum and wind my way back to the hotel for a welcome rest, and when I head out again later for dinner, the adrenaline of Rome is once again pulsing in my veins. I revisit Piazza Mattei—one of my favorite little squares—and find the sound of water in the tortoise fountain mingling with the lively tune of a nearby accordion. I continue on to Campo de’ Fiori and then Piazza Navona, where this time Bernini’s “Fountain of the Four Rivers” is blessedly free of its scaffold prison. 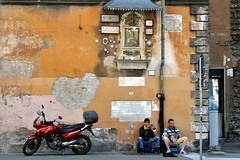 By the time I reach Piazza Campo Marzio, the sun has nearly set and my legs have given out at last. 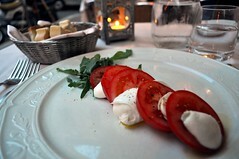 I crumble into an outdoor table and chair at Ristorante Boccondivino and dine well on a caprese salad and Veal Saltimbocca. Afterwards, craving sleep but not wanting the night to end, I walk to Hadrian’s Temple in Piazza di Pietra, up to the Spanish Steps, and back past the Pantheon to my hotel. It’s well past eleven when I crawl into bed. Exhaustion will come, and soon. 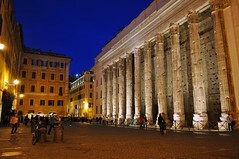 But as someone once told me: “Rome by night is magic.” Who wouldn’t want to prolong that?